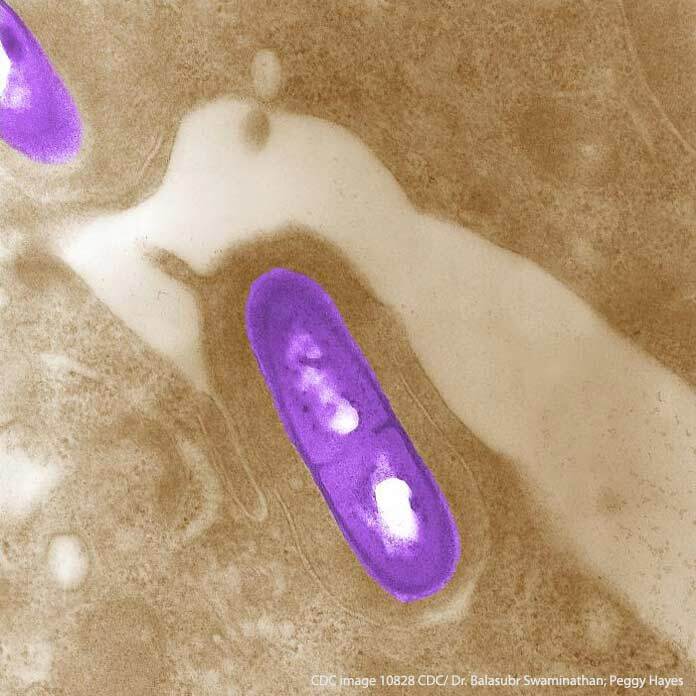 Why are Pregnant Women at Greater Risk of Contracting Listeriosis? Pregnant women are at greater risk than other healthy adults of contracting listeriosis, an illness caused by a foodborne pathogen, Listeria monocytogenes (pronounced lis-TIR-ee-ya mon-o-si-TAH-gin-eez). The Centers for Disease Control and Prevention (CDC) estimates that 2,500 people become seriously ill each year in the United States. Of these, one in five die from the disease. Pregnant women account for a third of cases each year. If a pregnant woman eats food contaminated with L. monocytogenes bacteria, she can have a miscarriage, still birth or early delivery. A baby born with listeriosis can get meningitis and die. Recent outbreaks have been caused by frozen vegetables, sprouts, caramel apples (the Gala and Granny Smith apples used to make), packaged apple slices, celery, soft cheese ice cream and raw milk. The bacteria initially invade cells in the lining of the intestines. They then multiply within the cell and move to adjacent cells. If they get into the blood stream, they can travel to the placenta and make their way from the outer lining of the placenta to the fetus, where they can cause premature birth, miscarriage or stillbirth1. To move from cell to cell, Listeria need to create certain proteins, including LapB. A recent study found that L. monocytogenes bacteria regulate output of this and other proteins to avoid detection by the mother’s immune system2. When L. monocytogenes invades a pregnant woman’s body during the first trimester of pregnancy, listeriosis can lead to a miscarriage3. When an infection happens later in the pregnancy, the result can be a stillbirth or premature birth. If an infected baby is born with listeriosis or a baby is infected during delivery, the infant can become seriously ill and die. Most fatal cases involve a newborn or an elderly person. If the pregnant woman is treated early, the unborn baby has a good chance of survival. The problem is that the symptoms are so mild in pregnant women that the woman may not seek medical treatment for their own symptoms. Can I Sue if I Eat Food Contaminated with Listeria while Pregnant and My Baby Gets Sick? You can call 1-888-377-8900 to get help. Attorney Fred Pritzker and his Bad Bug Law Team mothers and newborn babies get justice. Attorney Fred Pritzker and his Bad Bug Law Team® help families harmed by this dangerous pathogen. We are national food safety lawyers who represent clients throughout the United States. Fred Pritzker is a leading attorney for L. monocytogenes lawsuits. He has a national reputation for excellence that has led to his inclusion in The Best Lawyers in America. During his 30 years of practice, he has recovered millions for food poisoning victim, including over $3 million for a woman who lost her unborn babies. This tragedy was compounded because the woman was not able to conceive again. Our clients are not sue happy. They want answers, to know how the food was contaminated and why it was sold. Our experience is that a lawsuit is often the only way to get these answers. It is also important to get as much money as possible from the corporate wrongdoer to hold the company accountable. To contact a lawyer from our law firm please call us at 1-888-377-8900 (toll free) or fill out our online consultation request form. Janakiraman, Vanitha. “Listeriosis in Pregnancy: Diagnosis, Treatment, and Prevention.”. Reviews in Obstetrics and Gynecology 1.4 (2008): 179–185. S. Sievers, E. M. Sternkopf Lillebaek, K. Jacobsen, A. Lund, M. S. Mollerup, P. K. Nielsen, B. H. Kallipolitis. “A multicopy sRNA of L. monocytogenes regulates expression of the virulence adhesin LapB.” Nucleic Acids Research, 2014; 42 (14): 9383.